When you are working in a school, engaging day-to-day with children and their families, teachers, support staff, governors and other adults, you will know that you expend great amounts of mental, physical and emotional energy meeting the emotional needs of others. The long meetings, difficult conversations and fires you’ve had to put out over the course of the term (whether you realise it or not) are very likely to have taken their toll on you and your energy levels. That’s why it’s so important that you use your holiday time to really switch off from the pressures of running a school, sit back, relax, re-charge your batteries and above all, focus on your emotional needs. If you don’t, you will return to school not as emotionally and mentally robust as you need to be for the inevitable challenges. Statistics from the Institute of Leadership & Management (ILM) report that 3 in 5 Brits don’t leave their work behind when they’re on leave and feel “obligated” to take work with them on holiday, even when travelling abroad. But breaks are incredibly important; you need this time off to truly wind down. Yes, there may well be work that needs to be completed before you can fully settle into the holiday routine. If that is the case, take control of it and tackle it head on. Early on in the holidays, write a detailed to do list and make a realistic estimate about how long your work is likely to take. Then actively set aside specific time to complete the tasks on the list. This scheduled time may be at the start or at the end of the holidays. Do what suits you best! Just remember, that taking a moment to plan will help you to relax when you’re not working. This will release the mental load and enable you to feel free from work for the rest of the holiday. Over the last few years, technology has come a huge way; from having to use a dial-up cable to access the internet – we now live in a world where it’s possible to check our work emails in bed. This may be progress, but for many it has resulted in the development of a range of unhealthy habits. Whilst technology has in some ways certainly made our lives easier; with our work now on our phones, it can at times feel impossible to ignore work emails and truly switch off when on holiday. So I suggest you do something radical. If you have your school email on your phone, why not disable it or turn off notifications over the holidays. I know of many a Head who has done this, not just over the holidays, but once term has started they have kept notifications off at weekends too. This one simple action has made a huge difference to their sense of wellbeing and the feeling of being in control. Remember… you’re on holiday now; you’re allowed and expected to take things more slowly. If you continue to respond to emails and phone calls during your break, the more it will become expected of you. If the weather continues to be kind to us, do make sure you use the opportunity to get outdoors and get some fresh air as it’s a great way to feel rejuvenated. Time in nature literally allows us to recalibrate and let go of the stresses of modern day life; natural light helps us to sleep better, fresh air helps reduce blood pressure and simply appreciating ‘nature in its finest’ lightens our mood and increases our overall sense of well-being. If you’re feeling very energetic then join a gym or a daily walk is a great way to help you feel energised and get the endorphins flowing. If the gym is not your thing, then simply ‘being’ and sitting outside with a cup of coffee or a glass of cold prosecco, whatever takes your fancy, can do you the world of good! You may also find it helpful over the holiday break to carve out some time to consider people, events and personal accomplishments that you have been grateful this term. You could even start a journal of positive reflections that you can turn to if you’re ever in need of a pick-me-up next term. The holidays are also a fantastic time to revisit the “big why” behind your work as a school leader – the values that inspire you, your purpose and your vision as a school leader. Focussing on these things will re-fuel your passion. Serotonin, one of the happy hormones will flood your system and in turn will help to add that additional spring to your step when you return to school after the holidays. When the school term is in full swing, it can feel as though everything is happening at 100 miles an hour. With so many plates to juggle, your mind can become so busy that learning to switch off can become a task in itself. Sleep can be very difficult and you may find that you go for long periods of time without having had a good nights’ rest. Fortunately, holidays are the time when you can finally catch up on this much-needed rest, ditch the alarm clock and stay in bed for as long as you please. If possible, try to establish a new sleeping routine; whether this means going to bed earlier, reading a novel in bed or going for a walk – do something that helps your mind and your body to wind down naturally (Note, the list does not include checking emails before bed or surfing the net.) Simply do something that will ensure that you feel rested. As your body will respond better to a new routine rather than a sleep binge. If you do, you’ll start your days feeling energised with plenty of time in your day to enjoy your break. Our culture often leads us to believe that more is better, that to make the most of our time, we have to do more. Do more activities, visit more destinations and see more sights. Indeed, there are a million things, you could do over the holidays. If you try to do them all though, you’ll probably discover that they stop being fun and become stress filled activities instead. So, over the holidays pick a few things (a bucket list if you will), that you’d love to do or that you think your family will love and make plans to do them. This may be taking up a new hobby or visiting somewhere you’ve never been. It will give you something to look forward to and hopefully put a smile on your face while doing it. Likewise, you may also want to create a list of people you haven’t had chance to properly spend time with over the school year, those you want to see and catch-up with, and organise to meet them. Either way, by limiting the number of things you commit to and establishing your plans early in the holidays, you will reduce your stress and ensure you don’t get to the end of the holidays feeling you haven’t taken full advantage of the break. As we enter the second half of the spring term, your New Year’s resolutions probably feel like a long forgotten distant memory. Any well-being goals that were set, have perhaps now gone somewhat adrift. It may well be that once again you are firing on all cylinders, juggling a thousand plates and willing yourself to get through to the last day of term, with whatever reserves of energy you have left in your tank. But … what if as you approach the end of term, things could be different? What if you could consciously and deliberately shape the way in which you begin and end each term? 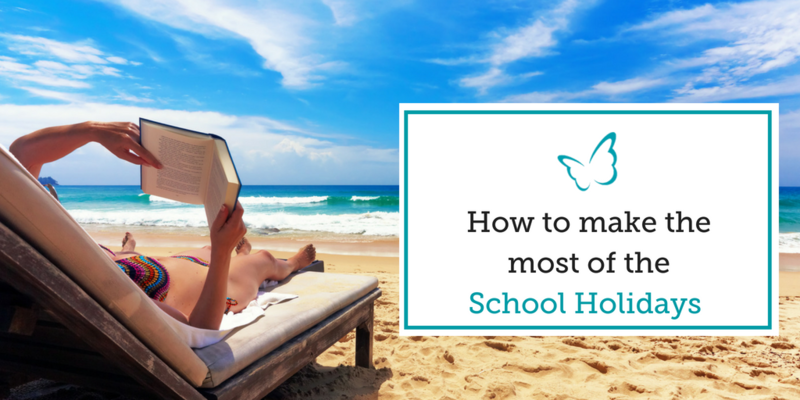 What if you could carve out some time for yourself to take stock, review the goals that you set at the start of the year and gain a clearer sense of what you want to achieve across the rest of the school year. If you were able to achieve all of the above, wouldn’t the term endings and beginnings be different from ‘normal’ for you? Wouldn’t you be in a better frame of mind to review and reflect upon all that has gone before and all that you have yet to do? 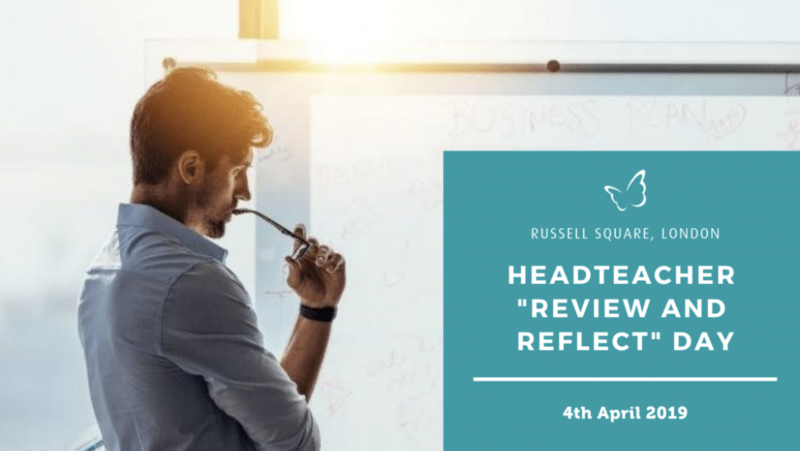 That’s why on Thursday 4th April at the October Gallery in London, we will be hosting our very first Headteacher “Review and Reflect” Session designed to provide school leaders an opportunity to do just this. The session will take place from 1:00pm to 4:00pm and will be designed to provide a facilitated and confidential space where leaders can reflect with fellow Heads.